The Marlborough Region, commonly known simply as Marlborough, is one of the regions of New Zealand, located in the northeast of the South Island. Marlborough is a unitary authority, both a region and a district, and its council is located at Blenheim. Marlborough is known for its dry climate, the picturesque Marlborough Sounds, and Sauvignon blanc wine. It takes its name from the earlier Marlborough Province, which was named afterJohn Churchill, 1st Duke of Marlborough, an English general and statesman. 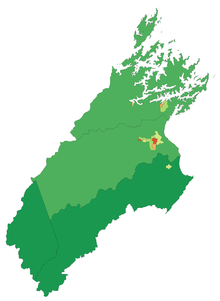 Marlborough's geography can be roughly divided into four sections. Two of these sections, in the south and the west, are mountainous. This is particularly true of the southern section, which rises to the peaks of the Kaikoura Ranges. These two mountainous regions are the final northern vestiges of the ranges that make up the Southern Alps, although that name is rarely applied to mountains this far north. Between these two areas is the long straight valley of the Wairau River. This broadens to wide plains at its eastern end, in the centre of which stands the town of Blenheim. This region has fertile soil and temperate weather, enabling it to become a centre of the New Zealand wine industry. The fourth geographic zone lies along its north coast. Here the drowned valleys of theMarlborough Sounds make for a convoluted and attractive coastline. The town of Pictonis located at the southern end of one of the larger sounds, Queen Charlotte Sound. Marlborough is administered by a unitary authority, the Marlborough District Council. Between 1859 and 1876 Marlborough had its own provincial government, and was known as the Marlborough Province, which ended when the Abolition of the Provinces Act came into force on 1 Nov 1876. Much of the region's population is found around the coastal plains around and to the south of the mouth of the Wairau, and in smaller settlements along the coast of the Sounds. Apart from the main urban areas of Blenheim and Picton, Marlborough's towns include Havelock, Renwick, Ward, and Seddon. Marlborough's world-famous former residents include rocket scientist William Pickering and Nobel Prize-winning physicist Ernest Rutherford. Marlborough can lay claim to starting the modern New Zealand wineindustry. Here in the late 1970s, Marlborough produced Sauvignon blanc, among other varieties, which led to confidence that New Zealand could produce interesting wine. Today, the Marlborough wine region represents 62% of total vineyard area in the country. The kingvarietal here is Sauvignon blanc, closely followed by Pinot noir and Chardonnay. The strong contrast between hot sunny days and cool nights help vintners extend the ripening period of their vines like nowhere else, resulting in unique expressions of their grapes. For example, Sauvignon blanc from Marlborough offer unique aromas and flavors, which earns them much praise from wine lovers around the world. The majority of Marlborough's extensive vineyard plantings are around Renwick,Blenheim, and Cloudy Bay in the Wairau valley. Further south in the Awatere valley are plantings near Seddon. These are for the most part on old terraces of theWairau and Awatere rivers. The area is widely considered by many critics to produce the world's best Sauvignon blanc. One wine critic said that "no other region in the world can match Marlborough, the northeastern corner of New Zealand's South Island, which seems to be the best place in the world to grow Sauvignon blanc grapes." Wairau River, Tohu, Marisco Vineyards, Brancott Estate, Oyster Bay, Hunters Wines, Mud House, Cloudy Bay Vineyards, Framingham Wines, Saint Clair Estate Winery and Grove Mill are notable vineyards in the region. Also important is the production of Methode Traditionelle sparkling wines, particularly near Renwick, from Riesling, Pinot noir and Chardonnay.